Sarah McNally was born to be a bookseller. Her parents are Canadian literary legends, having founded the Winnipeg-based independent bookstore and cultural hub, McNally Robinson, in 1981. Now, with a number of other locations, McNally Robinson calls Sarah’s New York City venture a sister-store, although, regardless of its humble size and single storefront, McNally Jackson has become a colossal cultural force of its own. The selection is thoughtfully edited; each book has to spark something in Sarah’s soul before being placed on the floor. This intimate approach to bookselling trickles into the store’s overall atmosphere and the comfortable vibe that encourages curiosity with shelves of recommendations, seating areas, and a café to browse potential purchases or just hang out. Still standing, while many mega bookstores have been forced to close their doors, McNally Jackson is a true example of a how a small business is bound to survive when it has a beating heart. One could say that you’ve inherited the role of bookseller from your Canadian bookselling parents. When did you decide to follow in their footsteps? My grandfather thinks that entrepreneurialism is in your blood, and that if you’re raised by an entrepreneur you’ll be an entrepreneur, but it never occurred to me that I would do this. I wanted to work in publishing, and so I did, but as soon as I started to work for someone else’s company I thought, I can’t do this. I decided I wanted to start my own company before I decided what it would be. 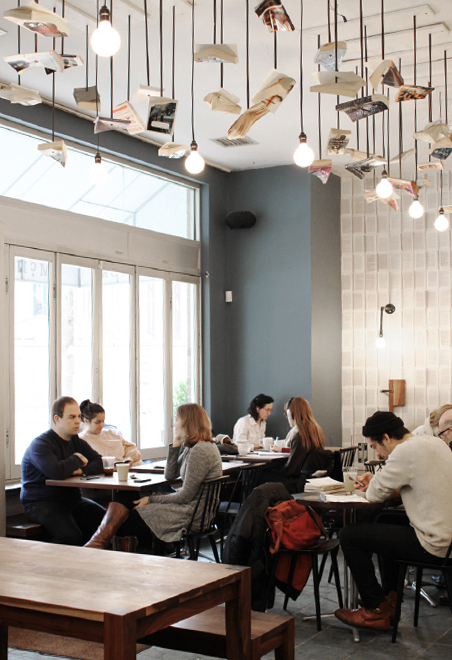 When did Mcnally Jackson open its doors? I opened the store in 2004. Very quickly, actually. I made the decision and did it within a few months. There have been some very basic innovations in bookselling like, cafes, places to sit, events. Not rocket science but stuff that had happened in every little city all over America and yet, somehow, had not come to New York. I thought it was kind of strange that we did not have any of that here, so I did it. How do you feel about the quick shift towards an embracing of all things digital and the digitalization of reading materials? I feel like that plateaued a couple of years ago and is actually declining in the areas in which I sell books. It’s still going strong in the real mass-market categories but romance, and genres like that, are not huge with my customer. It’s no longer a growing issue. In a funny way, books are a terrific technology. There are some technologies that are actually hard to best and I think the physical book is a technology that is actually hard to best. It’s extraordinary. And it’s democratic - the richest man and the poorest man in the word, same book - which I love. The selection at Mcnally Jackson is very extensive but, at the same time, very well edited. How do you decide what to bring in and how involved are you in the process? I’m the main buyer. We have a full time Art and Design buyer who does Photography, Art, Fashion, Architecture, Interior Design, and Design. I don’t have the knowledge base to do that at all anymore. Whenever one of those books is in my catalogues it’s often way too middlebrow for my buyer! Way too middlebrow for her. I don’t understand those sections anymore. We have a kid’s buyer, a small press buyer who finds chapbooks and deals with all of the small presses, and then we have Doug, my co-buyer, who does all of the university presses. I do all of the stationary and the big publishers. I look at tens of thousands of books a year but only choose a small percentage of what I see. I probably see five hundred diet books a year. It’s so disheartening. But then you have a publisher like Knopf or Farrar, Straus and Giroux and going through their lists is just blissful. The books that they’re finding, and the covers they’re putting on them, are so fun to see. I miss buying university presses, though. That’s where the true undiscovered, strange books hide. If I were to start a publishing house, I would love to start one that just combed through the university presses to take say, a single chapter out of long academic books. That would be amazing. You do see it happening. I used to go to France every couple of months and, browsing the bookstores there, I would find these great pieces translated from English and wonder why they weren’t available in my store. I’d find out later that they were part of this massive, seventy-dollar book. As I get older, I’m almost exclusively a non-fiction reader. I read and re-read Proust and a bit of poetry. I read history, science, and math a lot lately. Theoretical math books are actually really fun. I love the idea that there are essential truths about how our world works that you can access through logical inquiry and logical imagination. I still read fiction but maybe only three novels a month. I’m not super inspired by contemporary fiction. What’s the best novel you’ve read recently? Every once in a while something comes along that really rises above. I bought all four of Elena Ferrante’s latest books and I thought those really rose above and brought something new to the table. If I had to choose one book it would be In Search of Lost Time by Proust. Do you do any writing yourself? I’m actually writing a book. Well, it’s not a real book, it’s a book for women on how to run their own businesses, get their act together and own their lives. I don’t know if I will ever finish it. I wrote four chapters and it went great until I realized that I wrote less than ten percent of a book, so I stopped. It’s really no small thing to write a book, even an easy, business self-help book. I just want to write something really funny and readable. Can you sum up your message or give a snippet of advice to those of us who can’t wait for the book to come out? I think this lifestyle is a good choice for women. What made me want to write the book was that I saw all of these women who did not have any control over their work lives. I know a lot of people who had to decide between work and children. It’s very hard to find a middle ground. How can women really ever be equal with this structure? We remain technically dependent. When you own your own business, you have control over your work life. You can balance things out in your own way. America isn’t going to figure that out for us. We have a very family-friendly workplace here. I give paid paternity leave. Family often comes in. We’re a bit different. And, on the topic of advice, is there anything that your bookselling parents taught you that you’ve held on to along the way? Never forget the weirdos. My father gave me a lot of financial and business advice but my mother said, “Never forget the weirdos”. I love that. And there are so many weirdos in me. In all of us. All of the books that I buy cater to that. I only buy what I would read, if it were a different world and there were two hundred hours in a day.